KayLeigh Duerksen thought she loved clothing. The Bloomington native started out her undergraduate career studying apparel merchandising at the College of Arts + Sciences with a minor in marketing. It wasn’t until an internship with Bloomington-based part manufacturer TASUS that she decided to pursue a human resource management degree at Indiana University’s O’Neill School of Public and Environmental Affairs. 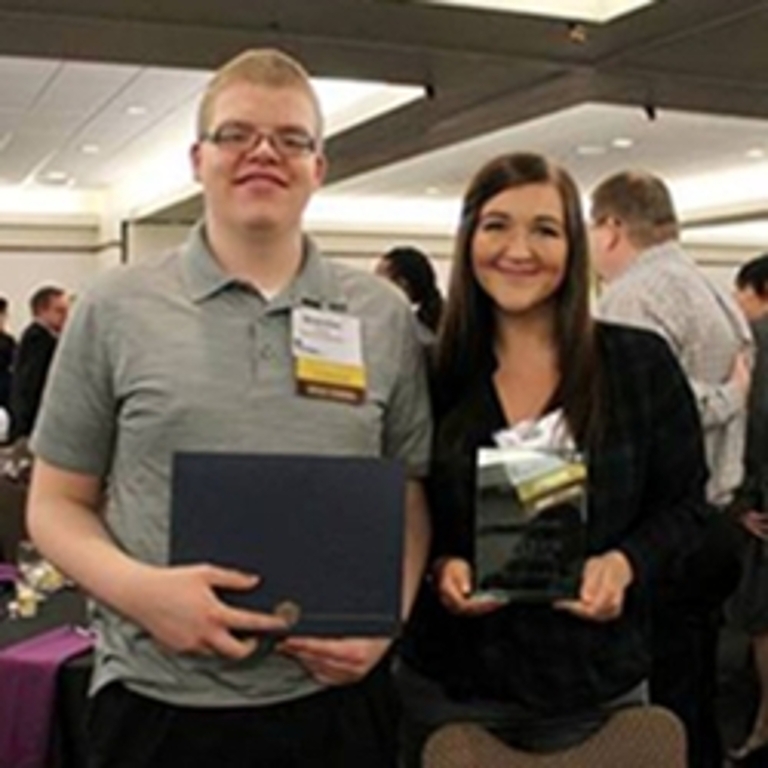 Duerksen, a junior, was recently awarded Intern of the Year, an Indiana INTERNnet Impact Award, which recognizes excellence among interns. Her direct supervisor at TASUS, who is working on a master’s degree from IU, nominated her, she said. Duerksen was honored during the 11th annual IMPACT Awards luncheon in February 2017. She met Tamika Catchings, a four-time Olympic gold medalist and WNBA All Star, who delivered the keynote address. Duerksen believes she stood out from the 40 other interns who were nominated in her category because she’s combining two different fields into one position. At TASUS, Duerksen uses the skills she’s learning in marketing to put together sales presentations and manage the company website. She also spends time working with the human resources department, developing her other interests. Duerksen has been with TASUS for a year and continues to work three days a week while attending the O’Neill School of Public and Environmental Affairs. TASUS makes plastic injection molded parts for companies such as Tesla and Toyota. Duerksen’s internship has taken her to facilities in Texas and Alabama and she’s worked on the plant floor to get a sense of what happens daily. One thing she likes about the company is how small it is. “I know the president. She’s even brought me coffee,” Duerksen said. TASUS’s president and CEO is Melanie Walker. Walker, an IU Trustee and former member of O’Neill’s Dean’s Advisory Council, was named the first female president of a Japanese-owned North American manufacturing company at age 34. She, too, rose through the human resources department. Duerksen’s advice to someone considering an opportunity outside his or her comfort zone? “To really know, you need to get your hands in it. I thought I loved apparel. I’ve enjoyed every minute at TASUS,” she said.